Analysts, however, were critical of the group’s metal inventories which had built up to between four to five months following a period of price highs for the steel-making material. 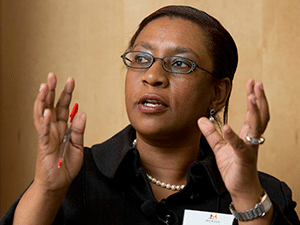 Zanele Matlala, CEO of Merafe Resources, said in a conference call that efforts would be made to reduce the stockpiles to three to four months – a more comfortable level – especially as the company produced less ferrochrome during winter. There had been “a standoff” between buyers and sellers during price highs, she said. Standard Bank Group Securities analyst, Tim Clark, described the stand off an “inefficient use of cash”, and was critical of Merafe’s vague commentary in its outlook of the published results that it remained “… committed to maximising return to our shareholders in the near term in the form of dividends and will continue to assess opportunities to deliver shareholder value”. Asked for specifics, Matlala said the company wasn’t actively seeking to diversify or expand but would consider opportunities if “a dripping roast came along”. Clark responded that “dripping roasts” rarely presented themselves in the current market unlooked for. He asked if Merafe would therefore look to distribute more cash. “We have a minimum distribution policy of 10% on headline earnings but we will look to distribute more than that,” said Matlala. Merafe’s had a cash balance of R122.4m which compares to R263.3m at the year-end point. This comprised of cash held by Merafe of R37m (2016:R208.7m) and R85.4m (2016:R54.6m) being Merafe’s share of the cash balance in the Glencore Merafe Chrome Venture. Despite the criticism, Merafe produced an excellent performance in the half-year generating a 30% increase in cashflow from operating activities of R485m. Merafe halved debt to R207.8m (December 2016: R409.3m) and is now working on refinancing its debt facilities with Absa and Standard Bank. Headline earnings were 19.4 cents/share compared to 2.4c/share in the previous period. This improvement was owing to a 10% increase in production to record highs and extremely good pricing for ferrochrome in the period as steel-making grew in China which accounts for 60% of the ferrochrome market. Global ferrochrome demand increased by 5% to 5.8 million tonnes in the period. However the market was over-supplied and this has been reflected in the quarterly pricing trend which has been downwards. After rising to multi-year highs towards the end of 2016, the third quarter European benchmark ferrochrome price was settled at 110 US cents per pound (c/lb) which compares to 165c/lb for first quarter sales to Europe. As with Tharisa, a chrome and platinum group metal producer, Merafe warned that the ferrochrome market would remain volatile for the foreseeable future.